What is the difference between hydroponics and Aeroponics? How many plants can be propagated at once? What about disease such as damp-off? What type of plants can be grown in the system? Can the rooted Aeroponic plants be transplanted into soil media? Can the system grow my plants to maturity? What are the economic advantages of using Aeroponics? Can I grow plants from seeds? Is it profitable to grow & harvest tomatoes in the aeroponic chamber? How profitable is it to grow flowers, houseplants, trees and shrubs? Can Aeroponic technology be utilized to grow my plants for harvesting? Is Aeroponic technology ecologically beneficial? How do I measure photosynthetic light energy for my bulb? What is your smallest Aeroponic unit? What kinds of Aeroponic accessories do you have? 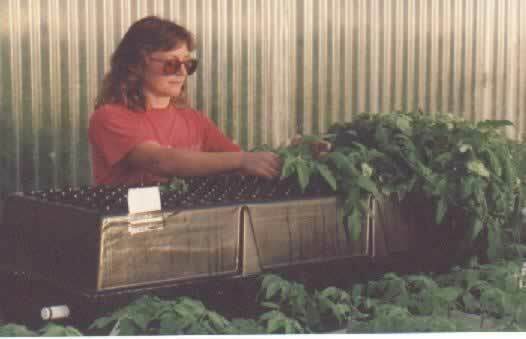 I want to make my own Aeroponic system - do you have componets I can buy? Do you have test meters for my system? How can I grow more lettuce? Can I grow trees and shrubs? Have independent laboratories tested this Aeroponic technology? How do I maintain a sterile environment for plant growth? Can I lease the aeroponic systems? Do you have a bench top unit? Can I grow inside a grow room under lights? 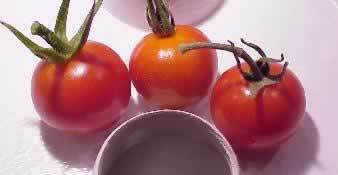 How can I produce my hydroponic tomatoes faster? Can I grow broccoli sprouts? Can I grow herbs, such as basil? Can I grow grains, such as wheat? What other kinds of plants can I grow? How do the ODC and Beyond bio-controls work? How the system is assembled? Has the system been endorsed by any government agency? 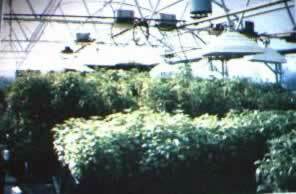 Where is the NASA / Aeroponic info found on your site? What other kind of plants can be grown Aeroponically? Can I reuse the nutrients and water? Has Aeroponics been discussed in any literature? Can I use Aeroponics in place of tissue culture? How does the system support the plants and keep them moist? Can the plants be transplanted into pots? Aeroponics International's patented Genesis Series Aeroponic System provides plants with an enclosed air and water/nutrient ecosystem, that stimulates rapid plant growth, without soil or media. Propagate and grow plants in days without soil! than 30 days! No need to transplant to soil or other media. The plants can be started from vegetative cuttings by placing them in the openings on top of the growing chamber. 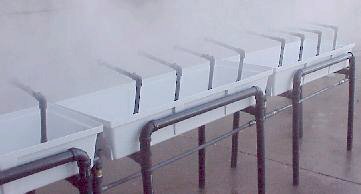 The microcomputer controller releases a pulsed hydro-atomized spray mixture of water, nutrients and growth hormones into the enclosed air environment of the growing chamber. The microcomputer supplies the timed spray intervals and duration for the plants. The plants rapidly develop root systems and grow in a moist air-rich environment. Just lift the chamber top to see how they are developing. The hydro-atomized spray provides just the right amount of moisture to stimulate the plants allowing it to be turgid as it develops. Click here to see how it works! Research shows that even tomato cuttings with fruit and flowers continue to develop and grow as the root system forms on its stem. How many plants can be propagated in the GENESIS SERIES Aeroponic SYSTEM? Each growing chamber has 161 openings (1/2" or 1") specially designed to support the plant cuttings or seeds. The grower can place 1 to 5 cuttings in each opening and root them in days (depending on species)! Plants do not stretch or wilt while they are developing their root system. After several days the root system begins to develop. 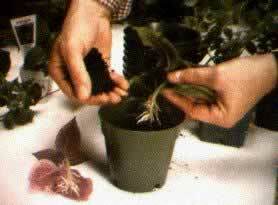 The plants can be easily removed without damaging their delicate root system for transplanting. The Genesis Series Aeroponic Systems provides the plant with a clean sterile environment that greatly reduces the chance of spreading disease, as found so often with other growing media. Unlike traditional soil methods, Aeroponic plant densities can greatly be increased due to the sterile conditions of this advanced technology. 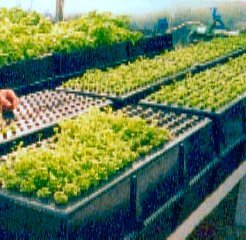 The Aeroponic system can easily be cleaned and reused many times, over and over again. What type of plants can be grown in the GENESIS SERIES Aeroponic SYSTEM? The system can grow many different plant species and cultivars including nursery stock, vegetables, bedding and houseplants. Researchers, commercial greenhouse growers and nursery operators have tested and grown successfully hundreds of different plants. Yes. Plants are easily removed without damaging the root systems and transplanted without transplant shock or setback to normal growth. 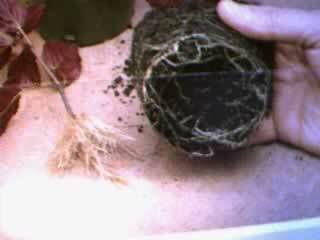 The transplanted air developed roots adapt themselves readily to almost any type media, including hydroponics. They can even be transplanted directly into the field. Can the GENESIS SERIES Aeroponic SYSTEM grow my plants to MATURITY? Yes. The Aeroponic system can grow herbs, vegetables and flowers continuously to allow the grower to obtain yields like never before. The system is perfect for indoor grow rooms and greenhouses. What are the ECONOMIC ADVANTAGES of using the GENESIS SERIES Aeroponic SYSTEM? This system is extremely economical when compared to traditional methods of growing plants due to the high yields and how fast plants can be grown in the system. The system has been proven to aid growers in optimizing rooting on easy-to-root and hard-to-root plants. This technology will provide an environment to maximize the overall total yield of healthy root cuttings. Faster growing times and higher yields are achievable when compared to traditional propagation methods such as pots and beds. Traditional propagation relies of sterilized soil media, who must be re-sterilized or re-potted, with fresh media after each propagation cycle. Yes! Not only can you germinate plants from seeds in this Aeroponic system, you can also propagate the plants from vegetative cuttings. You can even leave them in the system for harvesting, as shown in the above block diagram of the system's functions. Yes! 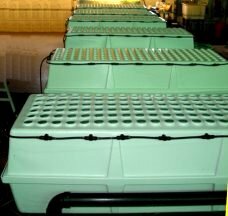 Aeroponics International offers a complete line of Aeroponic systems including RPB (a replacement for tissue culture) as well as water recycling technology for a closed loop system. All micro-nutrients and water are recycled; water loss is cut by 99% when compared to traditional methods. Is Aeroponic technology easy to install? Yes. The patented Aeroponic technology has been tested by universities, government agencies, and over 1,500 commercial greenhouses since 1983.